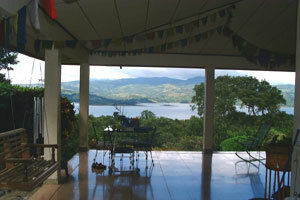 This is a secluded gorgeous house overlooking pristine jungle with a spectacular 180-degree view over Lake Arenal and the volcanoes Tenorio, Miravalles, and Rincon de la Vieja. The jungle is ICE property and is never for sale, so it will not be built on. There's a 1000-ft paved driveway to the main road around the lake. 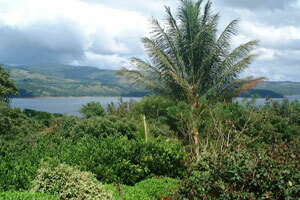 There are beautifully maintained gardens with a variety of fruit trees, flowers, bamboo, jungle and pasture. 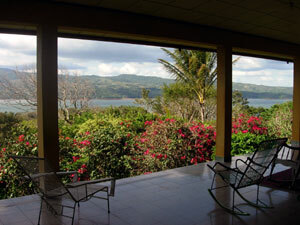 Monkeys and many birds, including toucans, can be seen daily from the verandas. 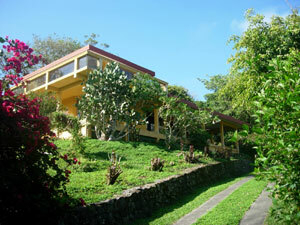 A short walk down a pretty lane is the Tilawa Resort with beautiful pool, tennis court, bar, restaurant. This luxury home has 5 bedrooms, 4 1/2 baths, a fireplace, and 1,000 square feet in lower and upper covered verandas in its 3,800 square feet. 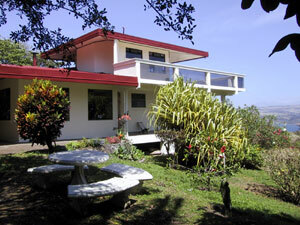 Also included on the 3.5 acres is a 1-BR, 1-BA guest house with garage. There's a fireplace, fully equipped kitchen, laundry, alarm system and two-vehicle carport. 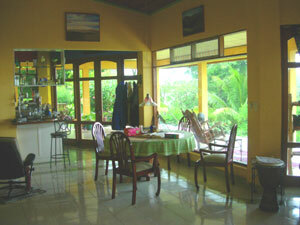 It's a 5-minute walk to the 3-star Tilawa Resort and complimentary use of the pool and tennis court. It's a 7-minute walk to Tilawa Windsurfing Center for year-round swimming and watersports. The hilltop town of Tilaran with its banks, supermarkets, restaurants and broad streets is just 15 minutes away. This secluded home has lots of glass and roomy, high-ceilinged comfort inside. 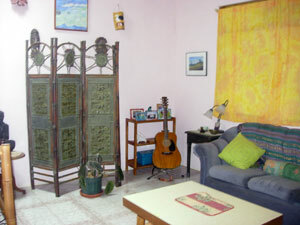 The library and TV room. 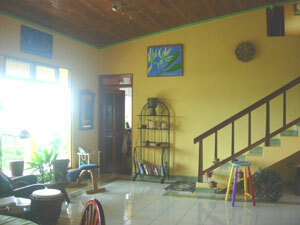 A broad open stairway leads from the living room to the second story. The first floor has a wide, wrap-around patio, the second floor a large deck.